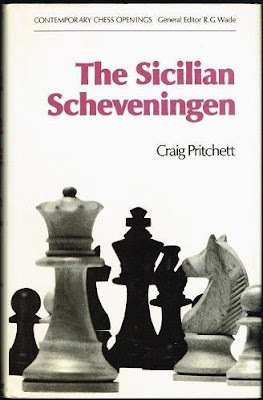 The Streatham & Brixton Chess Blog: Whatever happened to the Scheveningen? 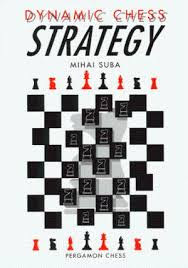 What I recall attracting my attention was this strange 2...e6 move, which seemed perfectly sensible to me but also seemed eccentric, given that when the Sicilian appeared in, say, My Sixty Memorable Games, it was always with 2...d6 or 2...Nc6. How strange. 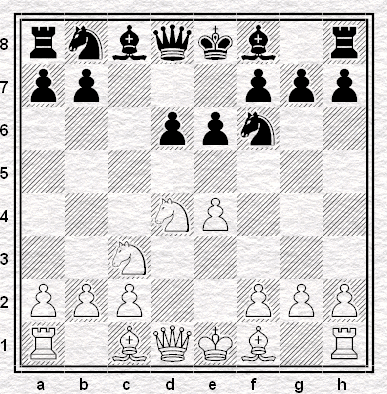 But it looked more solid and less subject to getting mated in twenty moves than the alternatives, so I paid attention. Later in my teens I found myself tempted by the Taimanov - I'd been looking at Karpov's games, and he had been an aficionado in his earlier days - and less sensibly the Najdorf, in which you likely did get mated in twenty moves. 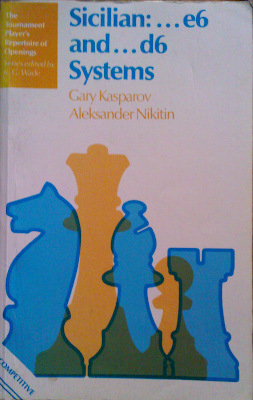 But I was interested enough to get Garry Kasparov's book, or what I thought was Garry Kasparov's book, though these days I tend to ask myself how much of it was Nikitin's work and how much Kasparov's name on the cover. What the cover didn't say, in fact, was "Scheveningen". But the Scheveningen was basically what it was. That was 1983, which when I both went to university and went into a few years' semi-retirement from chess, playing just a small number of inter-college games and some postal games to keep my hand in. 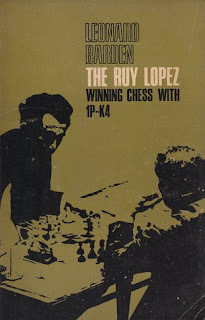 While I was sort of away, Garry Kasparov played quite likely the most famous of all Scheveningen games- and for that matter, one of the most famous games played between the end of the Spassky-Fischer match and the present day. 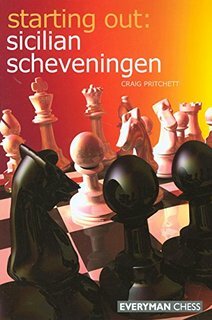 When I came back, half a decade later, I played (at first) the same openings that I had before, including the Scheveningen, even playing a couple ofhalf- decent games with it, or at least a half-decent game and a half. (The half-decent game can be viewed below. The half half-decent game is viewable here.) 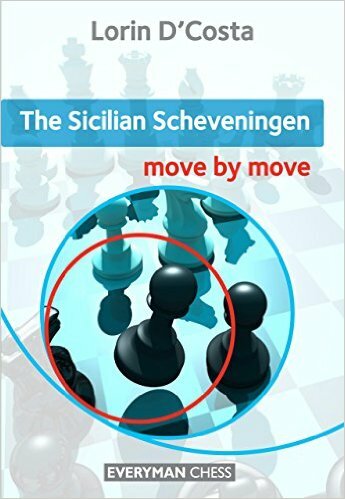 And then at some point or other I noticed that nobody who was any good seemed to be playing any Scheveningens, not via 2...e6 at any rate. 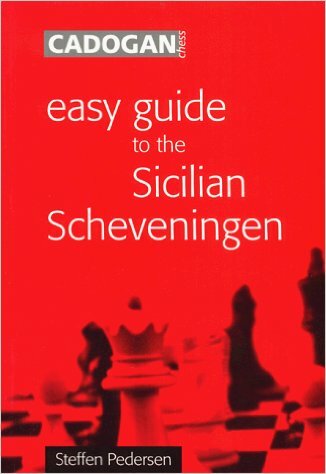 In 1993 Kasparov played ten Sicilians against Nigel Short, all with 2...d6: later in the decade, at supergrandmaster level, there was a lot of 2...Nc6, leading to the Sveshnikov. (Whatever did happen to the Sveshnikov?) But the Scheveningen seemed to be forgotten. but not, for some reason, by the current chessgames.com page, which gives 2...e6. Be that as it may, games 35 and 37 were Richter-Rauzers. 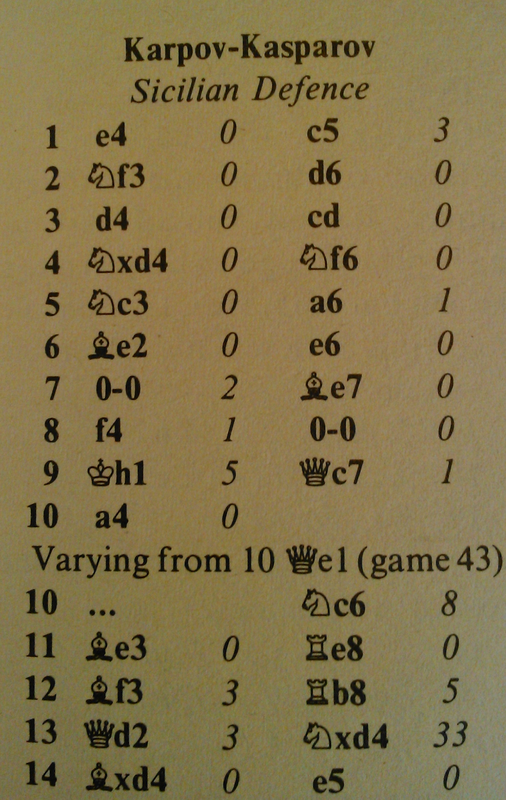 Game 3, though it began with 2...e6, went into a Taimanov, as did games 12 and 16 in the second match. Games 2, 10 and 18 of the second match, and of course game 24 as given above, were all Scheveningens - but they all got there via 2...d6. There was also game 14, which began with the hybrid 1. e4 c5 2. Nf3 e6 3. d4 cxd4 4. Nxd4 Nc6 5. Nc3 d6, after which Karpov continued 6. g4 taking aim at a knight which had not yet come to f6. 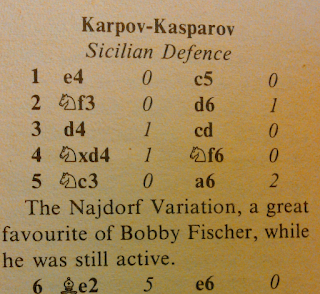 And in this eccentric choice lay, apparently, the secret of Kasparov's reluctance to come to the standard Scheveningen position by the standard order: the Keres Attack, 6. g4. Strong enough to play even without a knight yet there to threaten: stronger still when it's been waiting for you on f6 from move four. 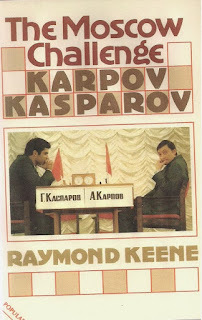 That was what Karpov had played in that very first game of the very first match, and although nothing apparently terrifying for Black had occurred in the game itself, Kasparov obviously had not liked either what he had seen or what he found later. He liked it for White, at any rate. and not fancying the first of those choices I went looking for another way to play with Black. but two later efforts haven't tempted me to open my wallet. I even bought an old secondhand copy of the original Pritchett, just for old times' sake, but I'd lost interest in it as an opening for the present day. Still have. At which point you may be asking, as I did not - what happens if Black goes with Kasparov's move order, via the Najdorf, and White plays 6. Be2 - is the Scheveningen still viable? And to tell you the truth, I haven't really got a clue. Nor much interest, since not playing the Najdorf was always what I was trying to do. But I can't say as I've seen much of it lately, by any move order. Then again. I can't claim to have been paying attention. And for all I know it'll crop up in the next few weeks as the opening of choice in Moscow. Or it really might be dormant, or dead, as an option at the highest level. 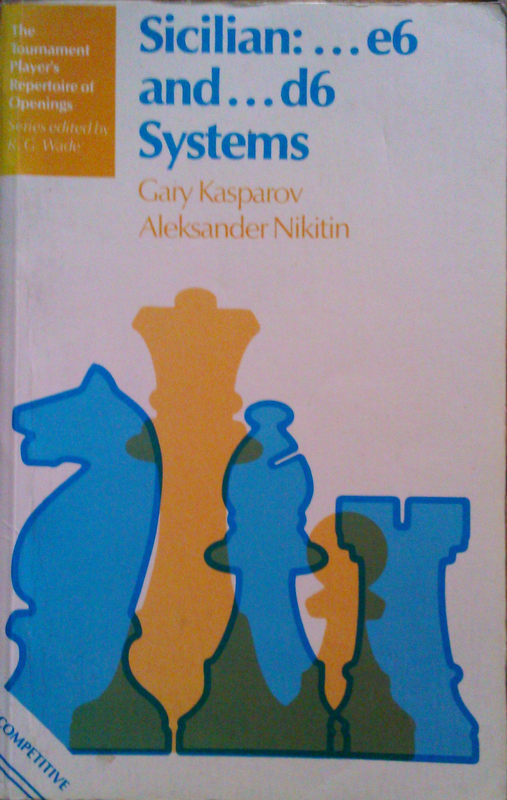 If it is - who, other than Karpov and Keres, killed it? Agreed, Keres Attack put it out of business. 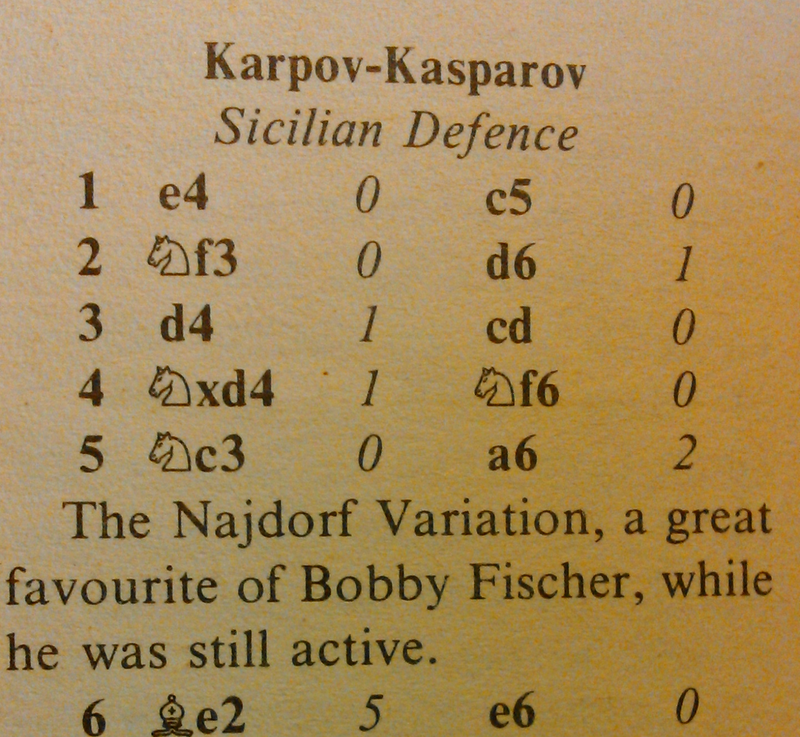 If I were to investigate further, I'd look at some of Polgar's games. 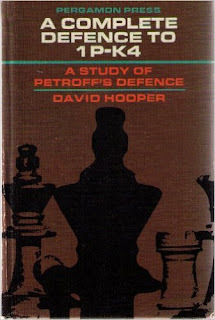 My first ever chess book was the 2nd edition of the Hooper and Cafferty book on the Petrof. Blue. Hardcover. Still in business at master level - every Informator has a few "B8" games. Most popular was the Najdorf with 3700, then the "Classical" (5. .. Nc6) with 1085, the Dragon with 948 and then the Scheveningen with 458. This was a position search, so includes all move orders. Against the Scheveningen 6. Be3, 6. Be2 and 6. g4 were all about equally popular. The English Attack, 6. Be3 remains popular against the Najdorf and at least some of the 6. Be3 Scheveningens are going to transpose. 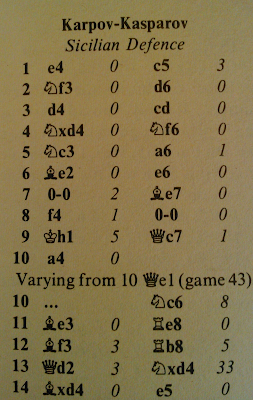 Players using the 2. .. d6 move order got hit with the anti-Sicilian 3. Bb5+ in 1306 games. Searching through the data of this season's 4NCL, shows 20 Najdorfs, 4 Classicals, 3 Scheveningens and 2 Dragons. 11 games with 3. Bb5+ as well. And how many move 2 deviations (most notably of course 2c3) were there? The sequence 1. e4 c5 appeared in 26166 games in the 2015 TWIC. The sequence 1. e4 c5 2. Nf3 or the transposition appeared in 20381. Including transpositions, the second most popular was 2. Nc3 with 2597, followed by c3 with 1829. I forget to include the Morra Gambit. At 424 it was the fourth most popular. It's surprising how unpopular the "pure" Grand Prix (2 f4) has become. Hardly anyone tried the nominal refutation, being 1. e4 c5 2. f4 d5 3. exd5 Nf6 with the idea of a pawn sacrifice by .. e6 if White plays c4. Admittedly GMs Lalic and Shaw both played it. 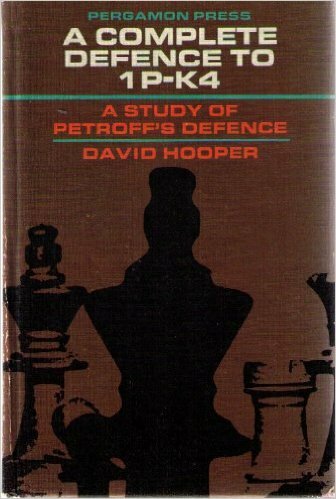 Given their reputations as theory hounds, that's a recommendation, but most players confronted with 2. f4 seem to have forgotten this counter gambit attributed to Tal.